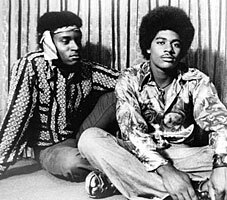 Danny Richard and Dwight Saunders of the band, Buckwheat. Known for their spontaneous blues-based jams and the pyrotechnics of Richard, Buckwheat was a three-piece high energy rock band that performed in the Tampa Bay area from the late 1960s through the mid-1970s. In addition to Richard on guitar and vocals, and Saunders on bass, Richard Radloff played drums. The band performed at Battle of the Bands and teen venues throughout the region, including the "Star Spectacular concert series" at Clearwater Auditorium, Indian Rocks Beach, Rowlett Park, and the old "Quest Inn" Coffee House in Downtown Clearwater. Digital reproduction of original black and white photograph. http://www.tampabaymusichistory.com/resources/buckwheat-danny-dwight.jpg. 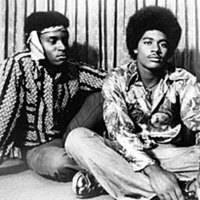 “Danny Richard and Dwight Saunders of Buckwheat.” RICHES of Central Florida accessed April 21, 2019, https://richesmi.cah.ucf.edu/omeka/items/show/5439.